My mother is a vegetarian but she cooks superb chicken and meat curries. But that is not her specialty. Her cooking repertoire is well-known for using local ingredients and turning them into delicious meals. I still remember, we use to get the gigantic bunch of raw banana from our farmhouse. So like a wise house lady, half of those raw bananas she used to wrap individually in newspapers and put in some warm place to mature. The remaining ones get loaded in colorful baskets and delivered to our neighbors as a pass over. But we use to help her in this whole mundane job for the love of her Kachhe Kele Ki Sabzi. It is a simple dry preparation of raw banana without using any onion or garlic. After marriage, when we moved to South India, I noticed every part of Banana plant is being used wisely, which is quite impressive. 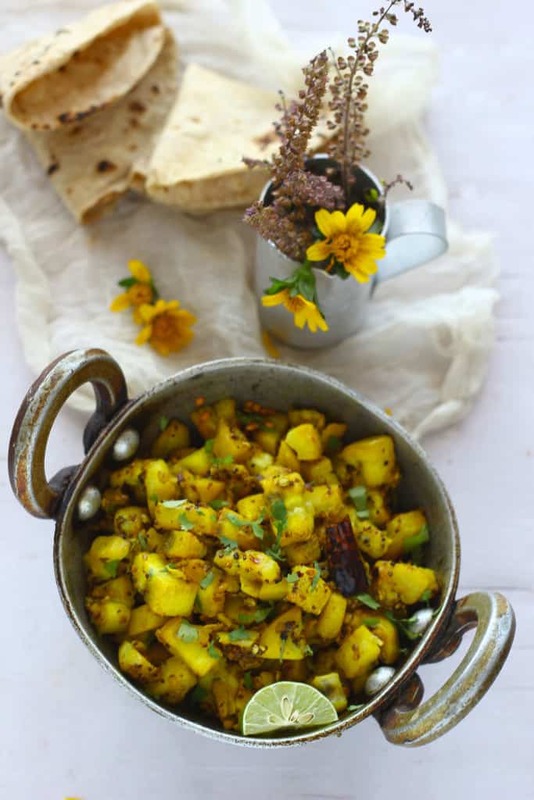 Plantain leaves are used for eating while flower and stem are used for making curries, interesting!!! Somehow I managed to understand the making of Kachhe Kele Ki Sabzi from my mother over a telephonic conversation and to my surprise after few trials it turned out perfect. Raw Banana does not need much time to cook or soften so while cooking does not add too much water. The nature of raw banana is very much similar to that of a potato, the same bland taste, quick to cook and prone to blackening if left cut for a longer time. Also, add sufficient oil while cooking to keep banana slices crisp and getting stick to the bottom. 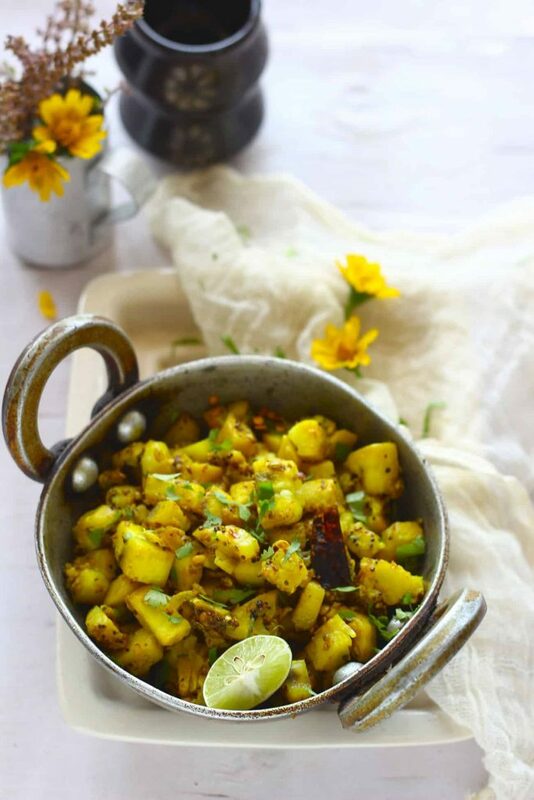 Kachhe Kele Ki Sabzi is a simple dry preparation of raw banana without using any onion or garlic. It is an excellent gluten-free dish using raw bananas. Peel the skin of raw banana, slit lengthwise, dice them and immerse in water. Grind the ingredients under ‘To grind to a paste’ with little water to a coarse paste in grinder. Heat oil in a heavy bottomed pan, add mustard seeds, once seeds start spluttering add urad dal and curry leaves. Add the chopped banana along with the ground paste, 1/4 cup water, salt, red chilli powder and turmeric. Stir to combine. Cook covered for 5 minutes over medium heat. Once the water evaporates completely, then keep frying until the masala turns golden in colour for approximately 5 minutes. Turn off the heat. Just before serving squeeze lemon juice and sprinkle coriander leaves. 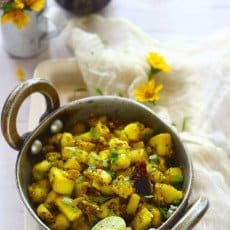 Serve Kachhe Kele Ki Sabzi warm with chapati and raita. 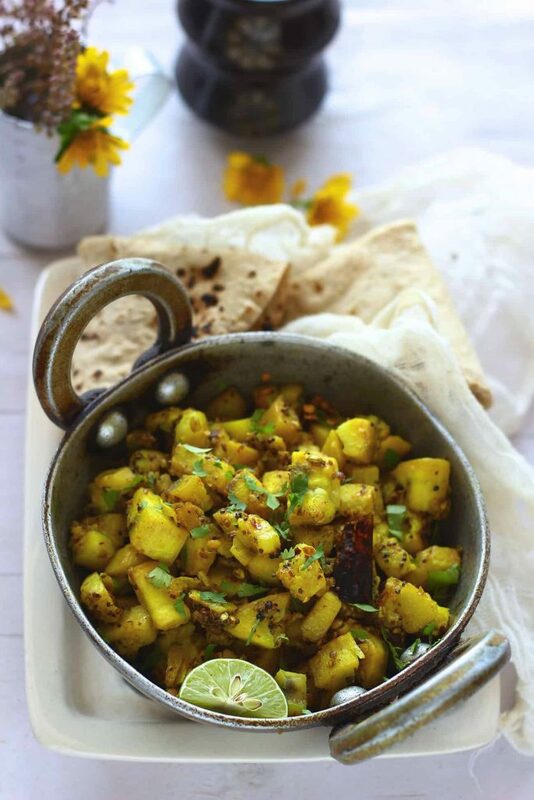 clean pics n yummy sabzi.. This blog is really great! I love the pictures on this blog because every picture looks really inviting! I will give this a try soon. Thanks for sharing this to us!